It's Pajama Party Time! Help us celebrate 19 years at Corn Wagon Quilt Co.! Where were you when you turned 19 years of age? I was away at my first year of college, making my mother an empty nester in search of a new hobby. 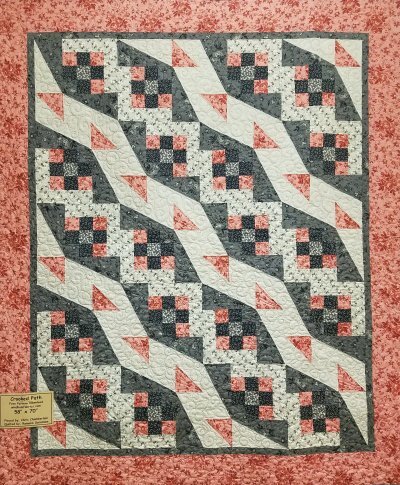 A longtime seamstress who had always admired the art of quilt-making, she signed up for a class at the newly opened quilt shop in town, Corn Wagon Quilt Co. It wasn't long before she was an employee for Marsha Harward. Nineteen years later, I am lucky enough to have followed in my mother's stitching as one of Marsha's quilt-loving Corn Wagon gals. Nineteen! Corn Wagon has seen many, many beautiful quilts walk through it's doors over the years, from national designers to talented locals, professionals and amateurs alike; quilt guilds, trunk shows, classes, clubs and events all with the effect of bringing together an inspiring quilt-making community. For this we thank you all! You make quilting creative, fun and incredibly rewarding. It's time to celebrate at our Birthday Pajama Party! Sale fabric (look for the red dot sticker will be $3.99/yd all day!!! Sale does not apply to services, class fees or block-of-the-month kits. be sure to visit our calendar and class list via our website regularly! It's here! 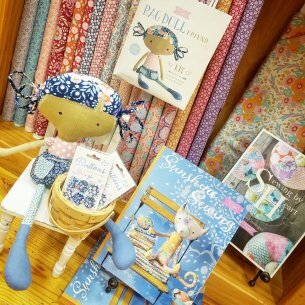 Tilda's new Bird Pond collection and with it comes this adorable Rag Doll kit, buttons and books full of wonderful whimsy. "Tilda is a fabric brand founded by Norwegian designer Tone Finnanger in 1999, best known for its whimsical and naive characters in the form of animals and dolls. There is a certain attitude to life in Tilda’s world, whimsical and romantic, like a ball gown worn with wellies – perfectly imperfect!" For more on Tilda click here! 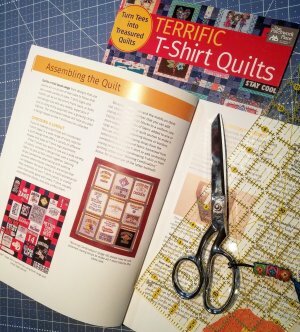 All those t-shirts you’ve saved commemorating school activities, vacations, concerts and best of all, loved ones over the years, can be made into a t-shirt quilt but there are some things you’re going to want to know before you begin cutting into them! Mary Jacobsen will teach you the best techniques for stabilizing, cutting, laying-out, and piecing t-shirt quilts, ensuring those memories come together successfully in a way that will last for years to come. Friday, November 16th, 10 a.m. - 4 p.m. It's time for our fourth month of Saturday Sampler! Doors open at 9:00 a.m. for those registered for this mystery block-of-the-month. Demos begin at 9:15 and repeat every 30 minutes. Last demo begins at 12:45. Don't forget to bring last month's finished blocks into the shop with you that day so you can pick up this month's blocks free! November 5th - 20% off all Minky & Cuddle yardage and kits! Marianne will be demonstrating how fun and easy wool applique is. She has lots of tips that she is excited to share with you. Sit in on this one hour, free demo to learn all the basics and ask questions with our wool expert. Once you see just how easy wool applique is to do, you will be excited to start your own project! Visit our online class list for all the details in joining in this great class series taught by Shelly Taylor!